The Cisco Catalyst 3750 v2 Series are next-generation energy-efficient Layer 3 Fast Ethernet stackable switches. These new switches support Cisco EnergyWise technology, which helps you manage the power consumption of your network, thereby reducing energy costs and carbon footprint. 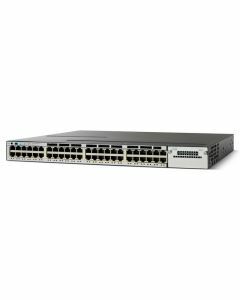 The Cisco Catalyst 3750 v2 Series consumes less power than its predecessors and is an ideal access layer for enterprise, retail, and branch environments. It helps increase productivity and protects your network investment by providing a unified network for data, voice, and video. IP Base software includes advanced quality of service (QoS), rate limiting, access control lists (ACLs), Open Shortest Path First (OSPF) for routed access, and IPv6 functionality. IP Services software provides a broader set of enterprise-class features, including advanced hardware-based IP Unicast and IP Multicast routing, as well as policy-based routing (PBR).